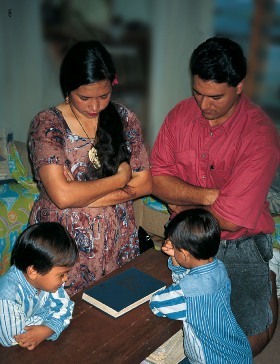 President Harold B. Lee taught, “The most important of the Lord’s work that you will ever do will be the work you do within the walls of your own home” (Strengthening the Home [pamphlet, 1973], p. 7). After Heavenly Father married Eve and Adam, he commanded them to have children (see Genesis 1:28). He revealed that one of the purposes of marriage is to provide mortal bodies for his spirit children. Parents are partners with our Heavenly Father. He wants each of his spirit children to receive a physical body and to experience earth life. When a man and a woman bring children into this world, they help our Heavenly Father carry out His plan. President David O. McKay said, “With all my heart I believe that the best place to prepare for … eternal life is in the home” (“Blueprint for Family Living,” Improvement Era, Apr. 1963, p. 252). At home, with our families, we can learn self control, sacrifice, loyalty, and the value of work. We can learn to love, to share, and to serve one another. Mormon Temples – In the Mormon religion, temples and families are tightly, inseparably linked. Temples make it possible for families to live together forever, through ordinances like eternal marriage. Family Home Evening – Family Home Evening is a time put aside each week for family members to come closer together and to Heavenly Father. It’s a time for the love family members hold for each other become stronger. It’s also a time for the family members to learn to live more righteously. Adoption – When unwed parents are either unwilling or unable to marry, the Church encourages that the child be placed for adoption, keeping in mind what is best for the child. Family Search – Family Search is the Mormon Church’s non-profit website devoted to family history research and available to anyone interested in learning more about their family history. LDS Family Services – LDS Family Services offers counseling for people experiencing an unplanned pregnancy, as well as adoption services. Although the organization is run by The Church of Jesus Christ of Latter-day Saints and provides counseling consistent with its doctrine, LDS Family Service does not turn away people of other faiths looking for counsel or adoption services.